The look of Emtek sandcast finish knobs is something rarely seen. The unique finish goes great with any shaped door knob. 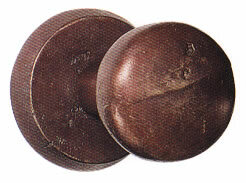 Take a look at the Emtek Sandcast Bronze Winchester doorknob. This is one of the great knobs that Emtek offers with the famous finishing. The door knob itself is a squished round doorknob and has a solid brass design that gives your hand a nice heavy feel to it. When you order this knob you can choose from four rosette types. The Winchester door knob also has four finish colors. You pretty much get to build your own custom doorknob. The cool thing about the sandcast finish of these doors is that it is a living finish. This means that it will slowly age over time. The base colors of the knob will work its way out. You get a doorknob that looks great now and just keeps getting better. Be sure to take a look at this great knob and our other Emtek door knobs.